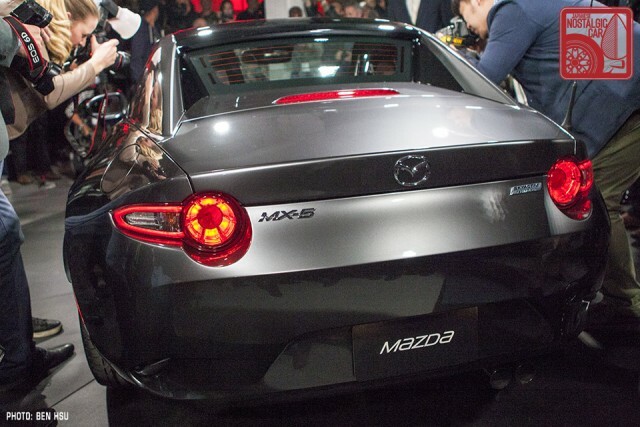 We’re live at the New York Auto Show, where Mazda just unveiled the 2017 MX-5 Miata RF. 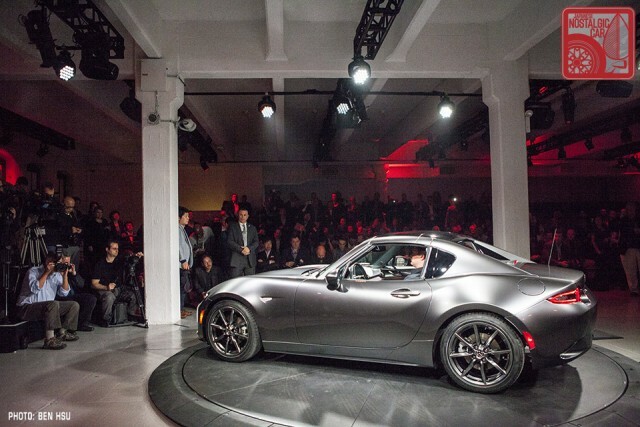 The “RF” stands for retractable fastback, and it’s pretty much the next best thing to a bona fide Miata coupe. The top has a targa setting, but the back window can be retracted as well. See for yourself in the video after jump. More details to come! 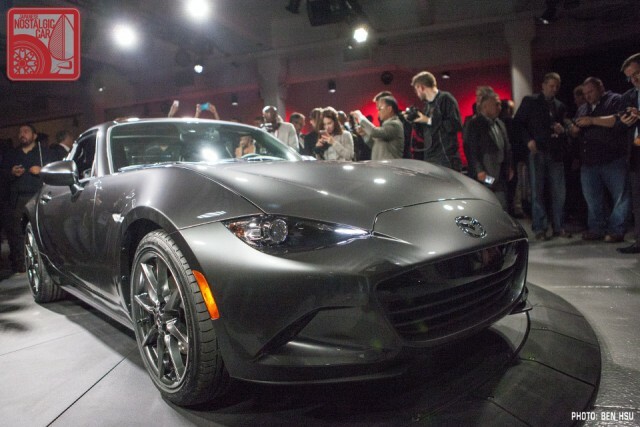 tagged: mazda, miata, Miata RF, mx-5, ND, new york auto show. 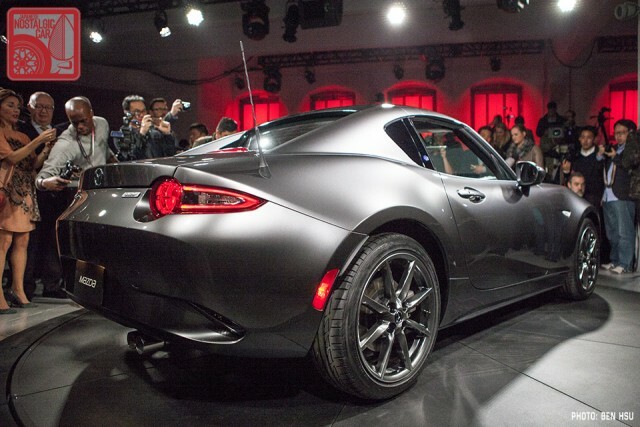 As a former owner of a NA Miata, I also like it. Shades of the Z4 M coupe. Now, if they would only drop in a rotary. You and me both. Still upset with Nissan over the IDx debacle. Nissan stopped being Nissan in 1999. It’s no longer a Japanese company what with Renault holding 40%, and the French government having 20% control in turn of Renault. Should a Nissan from the 21st century even qualify as a future JNC? What amazes me is that Nissan seems to have gotten nothing out of the deal… Maybe they’re sharing a chassis or 2; maybe some engine or electronic tech, but nothing in the CAR department. Are they at least getting market access? I took a little time to look around Renault’s web site(s), and their vehicles actually are NOT hideous. The Megane Tourer (wagon) isn’t half bad looking, and the Laguna is something Nissan could use, since they killed off the Altima coupe. The Captur would probably compete too closely with the Juke, but if they’re the same company/a blended family now, a sale of either one helps the overall bottom line. The Twingo could be competition to the Yaris and Fiat 500 (even with the weird, pop-out rear windows on a 4-door…), and there ain’t nothin’ wrong with the looks of the Megane Coupe’. Would it really be SO expensive to adapt some new urethane body caps? Most of the front ends even have that drop-down section in the middle, just ready for the V-thing design element. Seems to me some driveline mounts for already-certified Nissan-power, and some badging, and we’re good to go, and most people stateside would never even know it wasn’t actually a Nissan. It always bothers me when someone blames Nissan’s ills on Renault. Renault has made some utterly brilliant performance cars over the last few decades (thanks to Renaultsport) and its regular product range is, if anything, better than Nissan’s in most cases here in Europe. While the two cars are partners and share the same CEO, ultimately Nissan’s product decisions are its own, and if it’s not producing cars people want (which isn’t really the case, as many of its lines are quite successful), then it’s not Renault’s doing. More importantly, good for people who like to drive? I’m for putting on some new noses and bringing ’em stateside! I’m not sure really, Randy. To me the two companies are still very different in style and culture. Simply re-skinning a few Renaultsport models wouldn’t feel very “Nissan”. It’s possible though, as in reality, some models are already similar – most of the smaller models (Renault’s Clio and Captur, the Nissan Juke) already use the same engines and sit on a similar platform. They’ve shared engines in other cars before too – amusingly, a decade or so ago you could get a Renault Vel Satis (a bizarre front-wheel drive luxury car) with the engine from the 350Z. I suppose it depends how far off the mark one thinks Nissan currently is. People seem keen to put a bad spin on things, but the current range is actually pretty decent – if you accept that some models simply aren’t designed to appeal to enthusiasts. The 370Z and GT-R are still fantastic driver’s cars. The Juke is fun, even more so in Nismo RS trim. The Leaf, much as people love to malign electric cars, is fairly affordable and drives well – and hopefully, Nissan will see fit to replace it soon enough that they can keep its momentum up in the face of newer rivals. 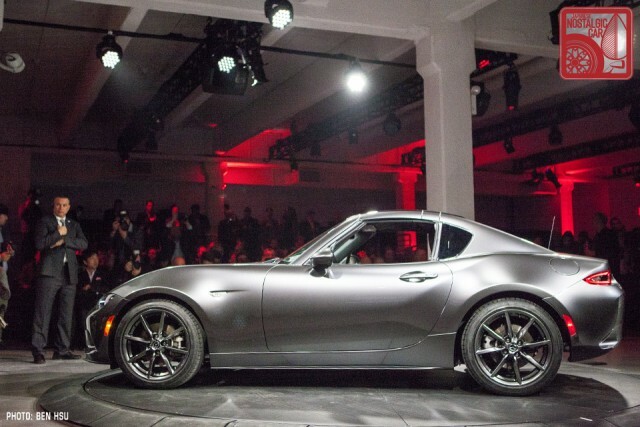 I’ve spoken to Nissan’s CCO, Shiro Nakamura, on a few occasions. He’s a proper petrolhead (has some *very* interesting classic Nissans in his garage) and I’m sure he has some great plans for the company’s future. I don’t think they’re BAD cars – a “proper” sports car doesn’t look to be in the cards for me, so that’s a non-starter for me, as well. My biggest across-the-board gripe is the lack of stick shifts in anything but the basest models. This is NOT limited to Nissan, btw. I understand that in Europe, manual transmissions are still popular, so it seems that shipping a few here would at least open up an ignored segment of the market – people who ENJOY driving a stick, but NEED the more practical aspects of a “responsible” vehicle. As far as Nissan is concerned, I gotta say that I couldn’t buy a present-generation Sentra, simply because I couldn’t get in/out, or grab the interior door handle to close it, without hitting my head on the A-Pillar (I’m not quite 6′ tall). I get the need to “sleeken” the cars, but a car shouldn’t LITERALLY cause a headache. That’s actually a thing with a LOT of cars, btw; not just Nissan. Not slamming Nissan, but some design considerations could make them – or anyone today – more enjoyable to own. I just looked up the Vel Satis – forgot about that car. I like it back to the rear wheels, then it just gets weird. I’ll reserve judgement till I see it in person, but just judging from the pictures provided it’s not attractive at all. Also looks alot like a 240z from the side. This was comfortably my favourite modern car at New York (I throw in the ‘modern’ qualifier because the hakosuka and kemeri were there…). 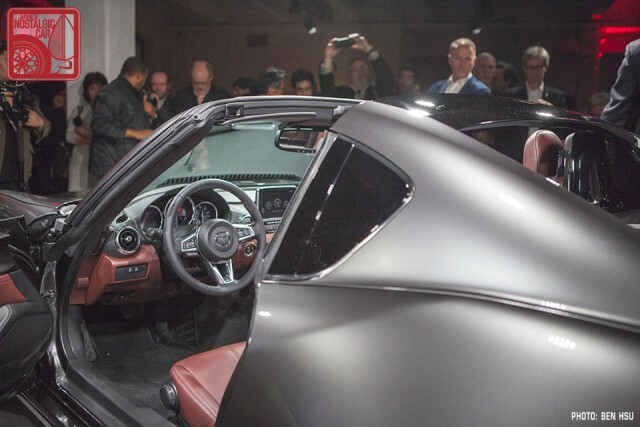 Looks far more attractive in person than in the press shots, the colour is perfect and the fastback shape is a novel take on the folding roof theme. If Toyota chooses to produce the S-FR, I think I’d have a hard time deciding between the two. Without advertising anyone else’s site, do a search for “Toyota S-FR.” Somebody rendered a ROADSTER version… If it has any basis in reality, your call’s going to be tougher yet! I’d actually be less interested in an S-FR roadster. Much as I like convertibles, the UK’s weather isn’t really conducive to their year-round use, and the rest of the time I’d prefer the extra torsional stiffness you get from having a proper, fixed roof. I’d have an S-FR exactly as it appeared in Tokyo: Neon yellow, black details, and a fixed roof.